Developed in the 1950s, the 'first-generation' or 'typical' antipsychotics, or major tranquilizers, changed the face of care of the seriously mentally ill. Patients with psychotic delusions no longer needed to be physically restrained but could be managed with medication. It was a breakthrough in psychiatric care. But it didn't take long to realize that these antipsychotics caused extrapyramidal symptoms (known as EPS), a serious set of side effects. Severe movement disorders, or dyskinesias, resulted, such as uncontrollable movements of the arms and legs, tongue thrusts, lip smacking, eye blinking. Other miserable symptoms were akathisia, a severe form of inner restlessness, often driving patients to walk anxiously in circles, and dystonia, a muscle tension disorder manifesting in strong, uncontrollable muscle contractions. Unusual twisting of body parts, odd movements of the eyes, and/or weird neck motions resulted. Sometimes symptoms resembled Parkinson's disease, like a shuffling walk and unusual hand movements. Throw vocal tics into the mix, and it was clear the typical antipsychotics took a heavy toll on their takers. This devil's bargain went on for decades--and then, then there was something new. Psychiatrists in Switzerland believed and worked to prove that antipsychotic efficacy and EPS were not necessarily interlinked. Enter Clozaril, an antipsychotic with no EPS. Its efficacy and safe clinical profile--safe from EPS, that is--were confirmed in clinical studies in the 60s and early 70s. Clozaril (clozapine), the first of the second-generation, or 'atypical' antipsychotics, had arrived in the psychiatric world. From whence it was promptly withdrawn. Sure enough it had a low EPS-side effect profile, but it had a different severe side effect known as agranulocytosis. This was bad news. Patients with agranulocytosis experience a significantly lowered white blood cell count. Given that white blood cells are the infection-fighting cells, people with the condition were at a high risk of infection--often serious. The situation was not satisfactory. Really, that should have been the end of the drug--with a side effect like that, who should be expected to take it?--except that schizophrenia can be so terribly difficult to treat. In fact, there really was nothing to manage treatment-resistant schizophrenia, so some researchers stay dedicated to the drug, including a clinical investigator at Sandoz Pharmaceutical Corporation, the first makers of Clozaril. At his encouragement, Sandoz sponsored a groundbreaking double-blind study of Clozaril in treatment-resistant patients--whose blood cell counts were closely monitored during the treatment. With strict blood monitoring, patients could be removed from the drug should untoward effects develop, and the psychiatric benefits were strong. Translation: Clozaril was still an effective treatment for schizophrenia without EPS side effects, as long as it included weekly blood tests. And thus it was approved in the US by the Food and Drug Administration in 1990, the first atypical antipsychotic. Clozaril was the first step in the development of one blockbuster medication after another among the atypicals. Likewise, it began the trend of untoward new side effects not fully revealed before approval, which would lead to a steady stream of lawsuits. Several effective, strong medications were developed, free of EPS symptoms. But accusations of wrong-doing would abound, lawsuits would proliferate, and the Department of Justice would take a stand. All the while, the new atypicals would earn millions if not billions of dollars a year, and become standard treatments not just for schizophrenia, but also for bipolar, and in some cases depression, the agitation that goes with Alzheimer's, and even autism. All the while the drugs would become more and more expensive. Under that arrangement, according to he New York Times, Clozaril became one of the world's most expensive drugs. Soon enough its prices would cease to stagger, as the other companies priced their atypical brands. Prescriptions for atypical antipsychotics would nearly triple from 1995 to 2008 in the US, with more than 16 million prescriptions for them written in the latter year. Then the pharmaceutical manufacturers added a creative invention: in addition to FDA approval for the original purpose, of treating schizophrenia, they marketed the drugs--without approval--for other ones. They paid a price--high costs, lawsuits--but ultimately achieved strong financial success. Johnson and Johnson's Janssen Pharmaceutica division was the second horse out of the gate with Risperdal (risperidone), approved by the FDA in 1993. By 1996 there were over 1 million prescriptions written for the drug. In 2003 it was approved to treat bipolar disorder, and in 2005 it was most prescribed antipsychotic in America, with revenue of over $2.1 billion. In the next 7 years loss of patent and the surge of other atypicals would knock Risperdal's earning power significantly. In the meantime this atypical, too, had its problems, as so many would turn out to have. In 2002 Janssen wrote an open letter to Canadian doctors warning of the risks of using Risperdal with elderly patients with dementia. In 2003 Janssen issued a second warning letter, this one to to American physicians. By 2011 and into the present, the gilt was off the lily, as Johnson and Johnson faced lawsuit after lawsuit accusing them and Janssen of hiding dangers associated with the use of the drug. This past April alone the company was sued by the state of Arkansas and ordered to pay more than $1.2 billion in fines. And the lawsuits threaten to keep coming. Slightly over a decade after Clozaril was approved, Eli Lilly launched its own atypical antipsychotic, Zyprexa (olanzapine), the third atypical on the market. It was a staggering success. Although researchers and clinicians continued to acknowledge that Clozaril was a more successful monotherapy than Zyprexa, it was still plagued by the white blood cell issue, of which Zyprexa was clear. In 1996, the FDA approved Zyprexa after clinical studies indicated it had reduced side effects from the typical antipsychotics, like Clozaril did--but without the devastating white blood cell issue. Eli Lilly thought it had 'the next Prozac,' and put great hope in its new antipsychotic, as Zyprexa became one of Lilly's most profitable drugs, with sales doubling from 2002-2003 to $8 billion. By 2008, the financial breakdown of the atypicals favored Eli Lilly and its Zyprexa--although time and lawsuits had taken its sales down, and would cause it to shift positions with other, later antipsychotics. Geodon (ziprasidone), a Pfizer product, earning $1.01 billion. Note that Clozaril, still acknowledged by clinicians to be among the most effective of all the atypicals, had been knocked out of the running due to its adverse side effects. And, as time would tell, Zyprexa was poised for a further fall. It underplayed significant weight gain that showed up in clinical trials, a move that would come back to haunt them. The New York Times found that internal documents clearly indicate that, during the clinical trials, 16 percent of people taking Zyprexa gained more than 66 pounds after a year on the drug. That figure was never disclosed to doctors. So--although Zyprexa turned out to be quite effective in treating schizophrenia--the lawsuits complaining of side effects began even before 2008. In 2005, Lilly agreed to a $700 million payment covering 8,000 patients, and by 2007 had made 2,500 individual settlements (value undisclosed). In January 2007 alone Lilly agreed to pay up to $500 million to settle lawsuits from 18,000 plaintiffs who developed diabetes due to the weight gain caused by the drug. By 2009 the numbers had increased, as Lilly worked with the Department of Justice to reach an agreement that involved a $1.415 billion payment as a fine for promoting Zyprexa for unapproved uses. Still and all, despite multiple lawsuits and a criminal probe, Zyprexa came in among the top earning drugs of 2010. Among the top drugs of 2010, 3 atypicals (all before patent protection ended), came in in the top 20. Abilify (the 6th atypical) came in 4th, earning $4,551,769,585, followed hard upon by Seroquel (the fourth atypical) in the number 6 slot, earning $4,349,322,433. Zyprexa was the 17th highest earner (one year before it lost patent), at $2,957,558,830. Since patent loss, its sales have declined precipitously. To return to those leading drugs, for a moment, let's look at Seroquel, approved by the FDA for treatment of schizophrenia in 1997, a year after Zyprexa. By 2002, maker AstraZeneca had recorded a 67% worldwide sales increase to $1.14 billion. In 2004 it was approved for treatment of manic phases of bipolar disorder, and in 2006 become the first atypical to be approved as monotherapy to treat bipolar depression. But as in the cases of the other atypicals, its maker couldn't leave well-enough alone, and by 2009 AstraZeneca was embroiled in lawsuits over its antipsychotic, too. Bloomberg Businessweek filed for access to internal documents, and found some unsavory details. 230 internal documents were released indicating a plan to turn Seroquel into a blockbuster drug by promoting it for uses for which it was not officially approved. And then, in a situation that mirrored that of Zyprexa's, in 2009 AstraZeneca was sued by 16,000 patients for "spinning, skewing and concealing" information on the drug's potential side-effects, including--yet again-- diabetes and weight gain. By summer 2010 over 20,000 patients had sued, complaining that the company didn't warn them about the weight gain and accompanying diabetes. Although AstraZeneca had successfully gotten many lawsuits dismissed from court, in August 2010 they agreed to pay those patients nearly $200 million. Instead of allowing the suits to linger on, however, and gather millions and billions, AstraZeneca faced them head-on, and by 2011 had settled almost all outstanding lawsuits at that time for a surprisingly low (in atypical terms) $647 million. Seroquel has continued to do well, even as two new atypicals gained approval. Worldwide sales were $5.3 billion in 2010, composing almost 16% of AstraZeneca's revenues, with U.S. sales making up $3.7 billion. 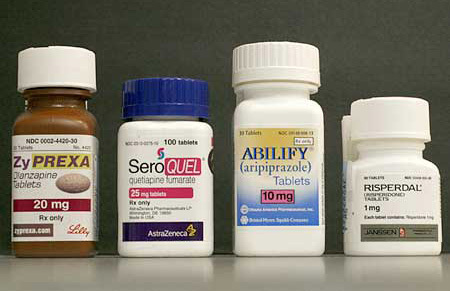 In 2011 Seroquel was #6 in the list of best-selling drugs, with revenue of $4.6 billion. Abilify was right ahead of it with $5.2 billion in sales--but that's only because the drug itself costs more. Still today Seroquel is the most-prescribed atypical antipsychotic. However, in March, Seroquel finally went off patent. Number 5, Geodon, was approved by the FDA in 2001 for treatment of schizophrenia. As opposed to the earlier atypicals, Geodon did not have the same weight-gain side-effect profile, and so had potential to out-earn its predecessors. The potential was never realized. By 2009, Pfizer had agreed to pay $2.3 billion in what was then the largest healthcare fraud settlement in the history of the Department of Justice (it has such been surpassed) for bribing healthcare providers to prescribe four of its drugs, including none other than Geodon. Geodon sales dropped from their 2008 $1.01 billion to $890 million by 2010, and it went off patent this past spring, forever ending a hope that it would have a run like Zyprexa or Abilify. By May of this past year BioTrends Research Group, one of the world’s leading research and advisory firms for specialized biopharmaceutical issues, found that Abilify was steadily shifting to a first-line treatment for schizophrenia. It was second only to the generic risperidone (formerly Janssen's Risperdal) in treatment of newly diagnosed schizophrenics, with the generic clearly imposing significantly lower cost burden. Abilify seems to have the most FDA approvals, the fewest lawsuits, a huge price tag--and to still be on patent. It's a winning combination for a drug that keeps raking in the money. Developed in Japan by pharmaceutical company Otsuka, Abilify is jointly marketed in the U.S. by Bristol-Myers Squibb and Otsuka America. It was not just FDA approved for schizophrenia (2002), but also for bipolar relapses (2005), as an add-on treatment for depression (2007), and for maintenance treatment for pediatric patients with bipolar and schizophrenia. U.S. sales of Abilify rose from $4.0 billion in 2009 to $4.6 billion in 2010. And it's set to hold on to patent until 2015. “Abilify has a more favorable tolerability profile, with a lower risk of metabolic side effects compared with other atypicals such as Eli Lilly’s Zyprexa, and has shown efficacy in reducing the symptoms of depression; both factors may be reasons why physicians are turning to Abilify earlier in the treatment algorithm." But where would an atypical be without a lawsuit about either hiding data or mismarketing or both? So Abilify joined the ranks in 2007, when Bristol-Myers was sued by the Department of Justice for a variety of wrongdoings, and Abilify was part of the problem. Accused by the government of promoting the sale and use of Abilify for off-label uses from 2002 through 2005, BMS settled on all counts, agreeing to pay over $328 million, of which over $25 million covered the Abilify wrongdoings. To this day, Abilify has the largest revenue of all the atypical antipsychotics, and, with its long patent hold, shows no sign of giving way. Despite lawsuits, despite mis-marketing or unauthorized promotion, the atypicals still hold two trump cards: They treat the positive and negative symptoms of schizophrenia (and often much more)--and they have almost no EPS. And thus they have done, well. . . atypically well in the market place.